So what's rugelach? 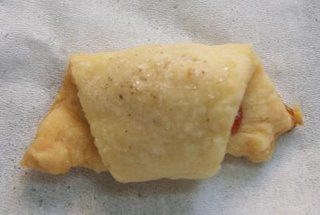 It's cream-cheese pastry dough, rolled then cut into wedges, spread with jam and sugar and fillings of choice, rolled into crescents and baked. First the dough. Dorie did it in her processor, but I just went and did it by hand. Put 100 gms cream cheese and 100 gms butter out of the fridge until they were soft but still cold. Added both to a cup of plain flour (I omitted the salt because I use salted butter). Rubbed the flour and butter/cheese until the dough came together. This is not a dough you knead a lot. Dorie now says to chill the dough overnight, but I figured it might get too hard to roll then. So I covered and chilled the dough for half an hour, then divided it into four balls and rolled each one to as perfect a circle as I could. I carefully put these circles between sheets of waxed paper and let them chill overnight. This morning, I chopped a handful of walnuts and raisins into really small bits. Mixed a tsbp of castor sugar with a hearty pinch of cinammon. Heated 2 tbsp strawberry jam in microwave until it melted. Now bring out your first circle of dough, spread melted jam on it, sprinkle cinammon sugar, walnuts and raisins. Cut the circle into 8 or 16 wedges depending on how large you make it. Now starting from the base of each wedge, roll it so it forms a crescent by the time you reach the tip. Place this on a non-stick baking sheet and roll out the rest similarly. This was Dorie's way. But was it messy! For the next circle of dough, I did it my way. I first cut the dough into wedges. Then I added the jam and filling separately in the centre of each wedge, leaving out the tip entirely. Made it so much easier to roll. I'd add another helpful hint here - don't take the dough out until the last minute. Specially in Mumbai heat, it will soon get too soft to roll. Once all your cookies are rolled, heat the oven to 190C. Brush the top of cookies with a little water, then sprinkle some cinammon sugar on each. Bake for 20 minutes, until they turn golden. That's the basic cookie - sweet but not overly so. It's so flaky you could be eating a very well-made pie. And can you see possibilities here. Think chocolate sauce and chocolate chips. Plus, the dough doesn't even have any sugar so rugelach's not even got to be sweet. I can already dream of tomato sauce and corn rugelach. Or pesto and goat cheese. Come back here in a few weeks, and you can bet this beauty's going to surface again. Soon. I bet this is the longest recipe post you have ever written, Simran!! This has been on my mind too - just never got down to making it. I knew when I read the recipe (Anita Chu's) that it has got to taste good - glad to see you and Sweatha giving it the thumbs up!! Yep prefect cookie..need to prepare too.. I know they are heavenly Simran.I too love them.Yes I agree Dories way can be a bit messy,but since I used light creamy ganache,it was ok with me.With jam/jelly it can be messy.Your method is also practical one.Waiting for savoury ones.I too am planning making savoury ones. Forgot to add,they are my perfect cookie too.Love them so much. Sunshinemom - I agree! Compared to what I usually make, this has to be one of the longest recipes on record. But totally worth it. Sweatha - You do get real Philly cream cheese out here. But then, you can now get almost everything from all over. Sounds really good Simran. I haven't tried these..will give them a shot soon hopefully. This looks deliciously flaky, Simran. Some of the rugelach I've had here have been cloyingly sweet, and I love that your version is not too much so. Very interesting but complicated:-( I have got too lazy after the holidays. I like stuffs with sweek filled in them.